Our beautiful Friendship Lights are perfect for the home and garden. Reflecting iridescent colours by day and creating a beautiful and ambient glow by night they make superb gifts for that special person. 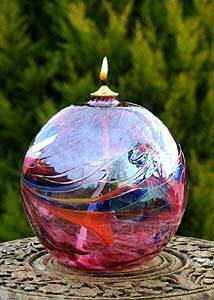 A selection of attractive Oil Lamps for use around the Garden and Home. Long lasting oil is a great choice for lamps, especially in the garden where they keep burning, even in a breeze! A stunning table-standing Oil Lamp with iridescent finish. Each oil lamp is individually boxed. Oil is not supplied. Roll over the thumbnails below to see a larger version.